It’s been a topic of conversation amongst my creative friends of late, about what constitutes an artist, artisan and maker, and at what point does one become commercial. 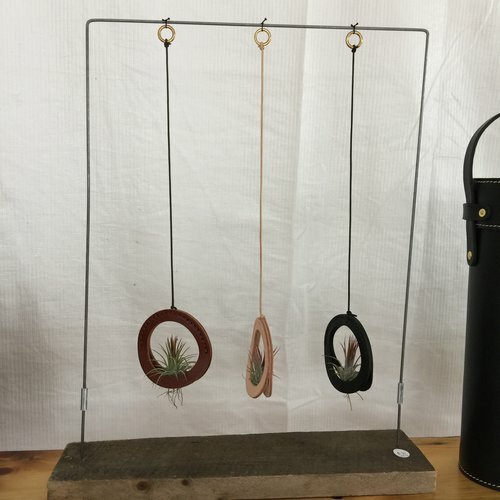 So I was primed to visit Field + Supply: A Modern Maker Craft Fair over Columbus Day Weekend. 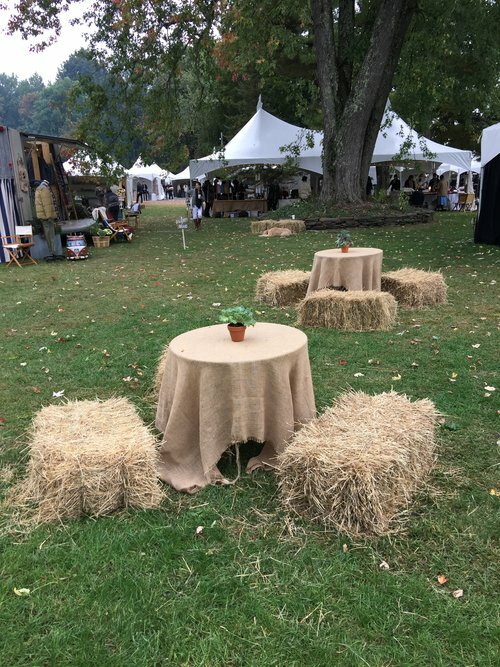 Intrigued by the gorgeous preview photos, and its mission as described by creator Brad Ford, to create a “modern interpretation of a traditional arts and craft fair”, I set out on a trek to upstate New York on a quintessential Fall day. 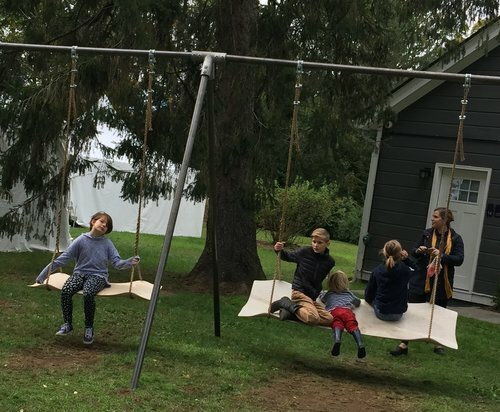 In it’s third year, the fair moved to a new venue, to the charming Hasbrouck House. Located in Stone Ridge, it’s situated in the gorgeous Hudson River Valley, about 80 miles north of where I live on the Hudson, 2 hours north of Manhattan. 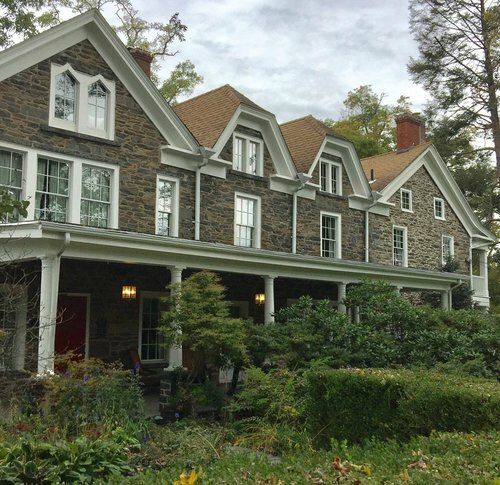 The Hasbrouck House, inn and grounds, in Stone Ridge, NY hosts Field + Supply over Columbus Day weekend. The region is known for it’s farm to table culture so it makes sense Field + Supply chose this as a locale. What I didn’t know is how many artisans have studios in the region. 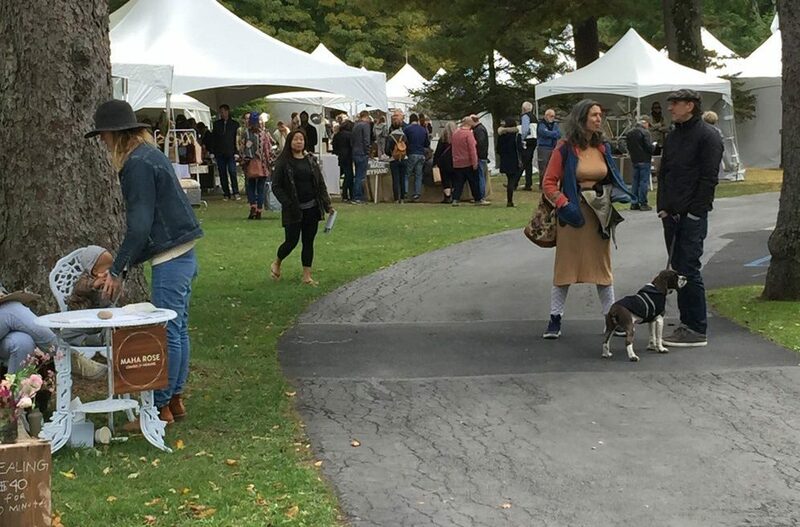 The fair featured many local artists and food purveyors while also bringing talented makers from Brooklyn and sources that Brad curated from his interior design business. 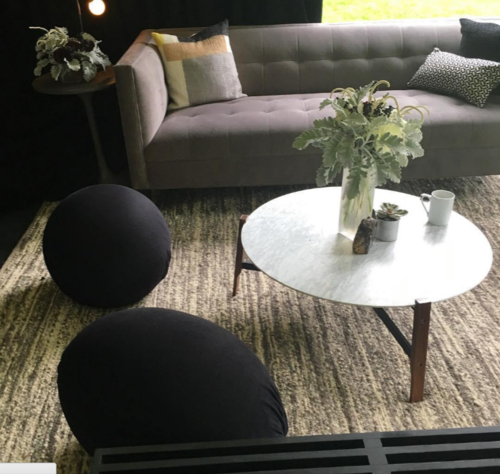 I first met Brad on the WithIt NY Design Tour in May at a presentation with Erin Connelly from The Commons at his showroom called FAIR in the New York Design Center. The concept for this showroom grew out of Field + Supply, he wanted to create an interior design resource to showcase artisans and makers. 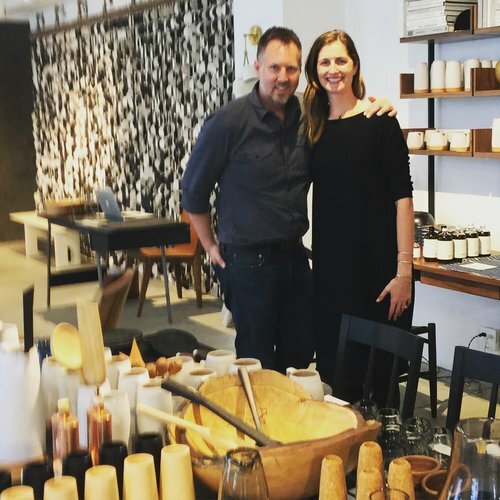 Erin Connelly of The Commons with Brad Ford in his FAIR showroom at the New York Design Center. 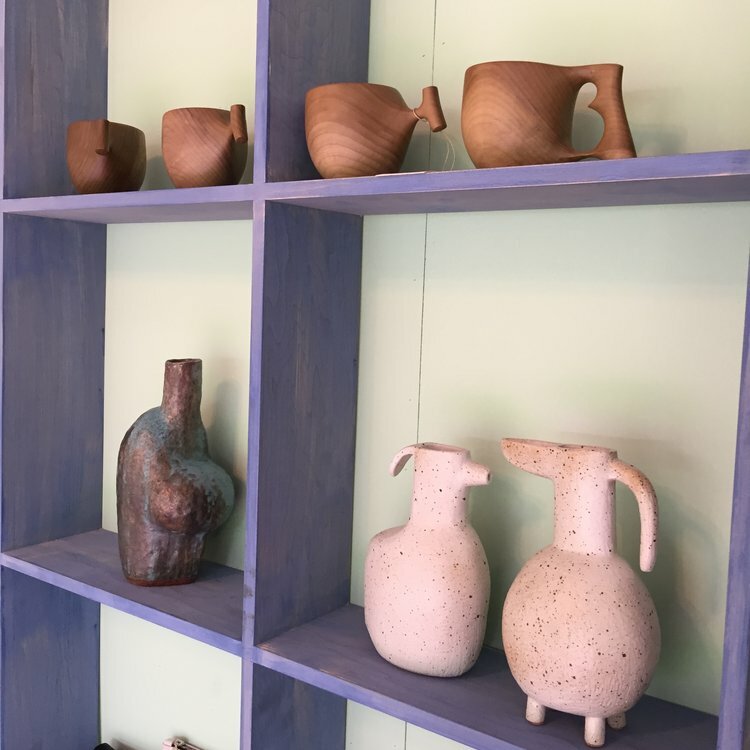 One of the Brooklyn artists Michelle Quan, of Mquan Studio, exhibited her ceramics. 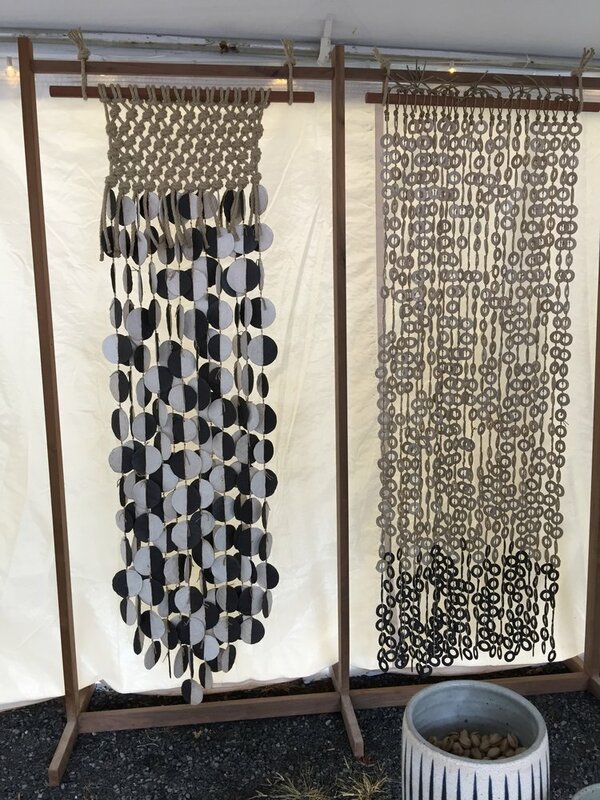 These stunning curtains / wall hangings were multi media, using stoneware, hemp and white oak, united by a macrame technique. 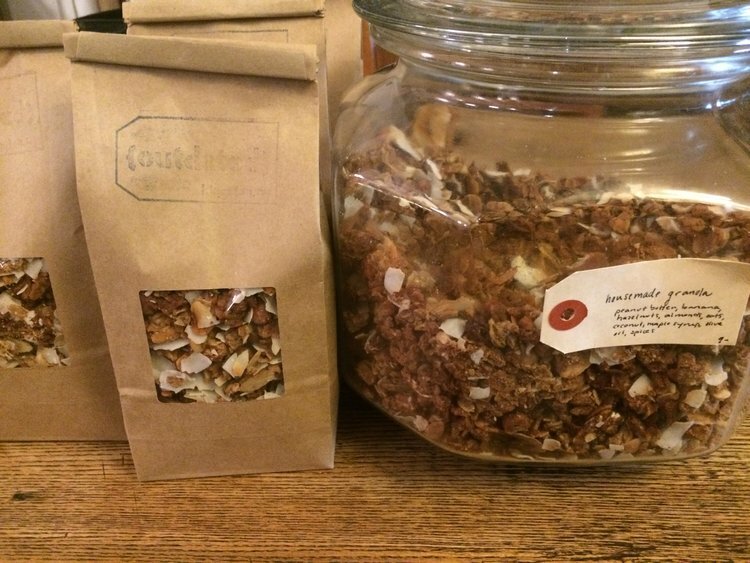 We are granola connoisseurs in my family and this mix at Outdated Cafe with shaved coconut and paper thin dried banana was the ultimate food find. I will definitely make a special trip to Kingston to visit this cafe which combines a mutual passion of vegetarian baking and antiques. Local food vendors were sprinkled throughout the grounds. I followed the scent of robust coffee to the Outdated Cafe. Based in Kingston, NY they sell antiques in a cafe setting. 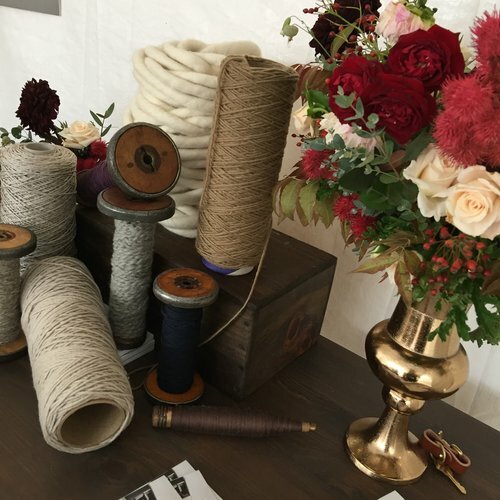 I spotted these rare spools of vintage metallic yarns and bought a few to make tassels. 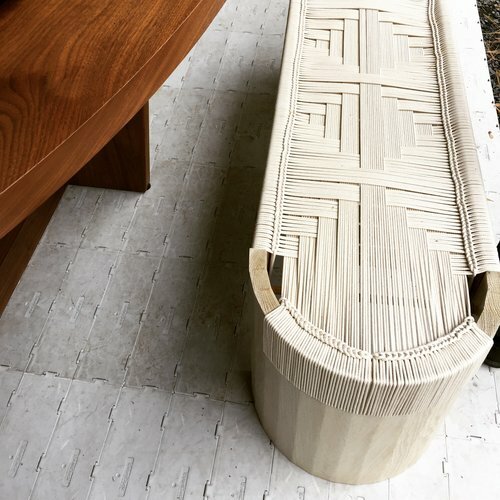 This woven Euclid bench by Kate Casey of Peg Woodworking stopped traffic. Kate walked me through her process and one can see her experience as a sculptor. She has studied both Peruvian and American Indian weaving techniques and the convergence of her skills as an artist, artisan and craftsman, shines in this exquisite piece. “I felt so lucky to be able to meet the makers behind all the beautiful collections that were represented. With social media, it’s become very easy to familiarize yourself with someone’s body of work while never actually meeting face to face to have mutually beneficial conversations, important to makers. 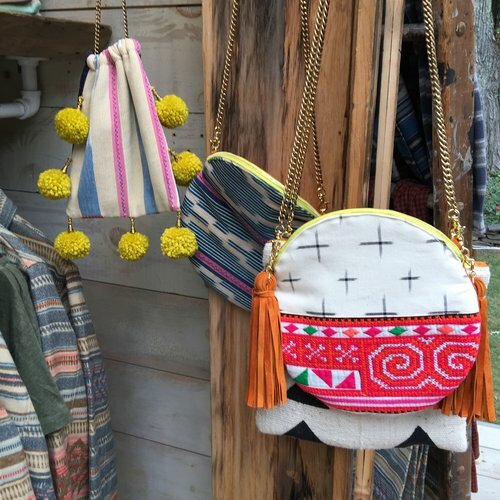 The pompoms and tassels on the accessories at Faherty drew me into to a brand that already has a cult following. The brother team of Mike and Alex Faherty, with experience at Ralph Lauren, hit a luxury note of rugged yet refined. They employ sustainable practices using eco-friendly fabrics, making product at family-owned factories worldwide. 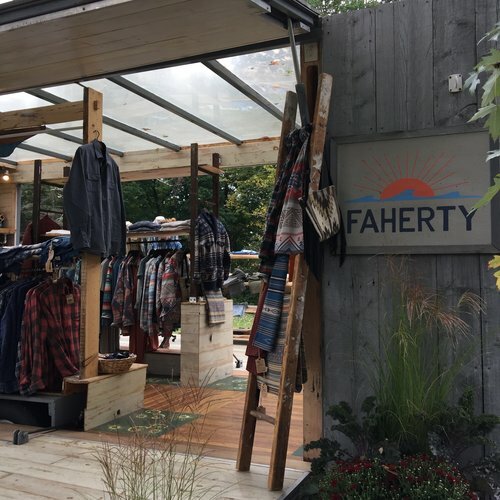 With stores in Soho, Nantucket and Malibu, their pop-up was the most polished with a relaxed vibe. 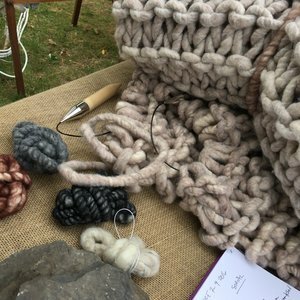 Another local maker at the show was Sawkille. 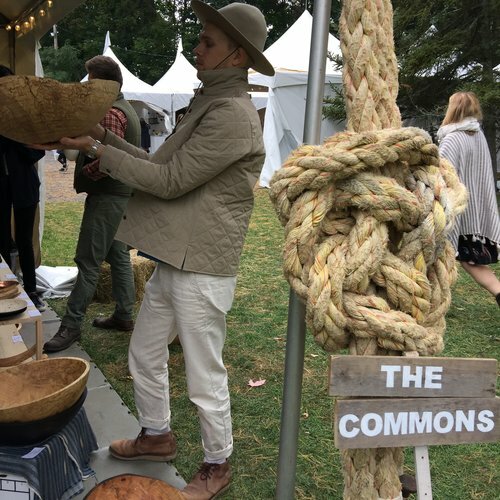 Founders and designers Jonah Meyer and Tara DeLisio have a showroom in Rhinebeck, NY with an aesthetic considered “Farmhouse Modern” but more importantly consider themselves part of a Rural American Design movement. They are furniture makers and also represent other artisans they admire; these Japanese cups were so elegant yet functional. See a video of their furniture making here>> Sawkille. 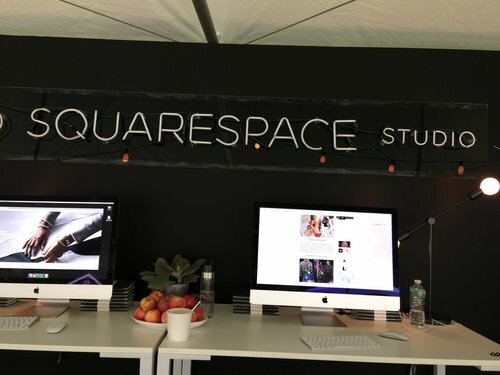 In the mix and one of the partners of the fair was Squarespace, yes, SQUARESPACE!!! They seem to cater to more creative and visual centric sites, mine included. I booked a one on one tutorial with Jose who helped me solve a design challenge. I also learned that they offer workshops in the West Villiage. 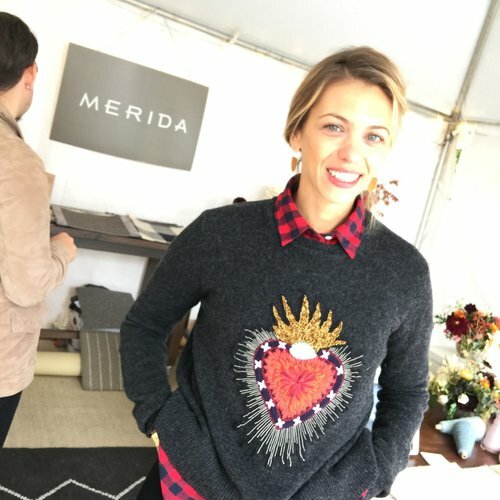 Michelle Barila at Merida wears a beautiful embroidered sweater that she could have sold ten times over to this design savvy crowd. Another partner of the event was MERIDA, maker of rugs and textiles. I had visited their mill in Fall River, MA last year, so I knew up-close their dedication to craftsmanship and their purposefulness in using the finest natural materials. 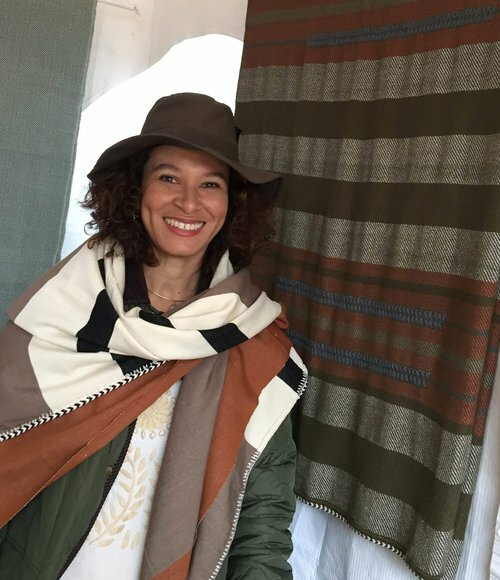 I loved their rug and yarn displays that told the visual story of who they are, a collaborative brand with integrity. 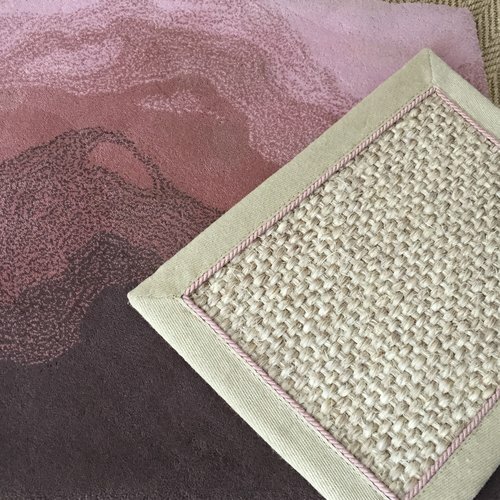 Beautiful examples of custom designed rugs from Merida. Note the linen cord inset on the sisal, one of the many types of edge finishes that they offer. 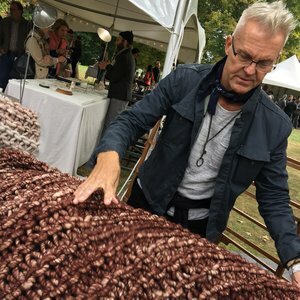 Morgan Spaulding of Phaedo Design, based in Kingston, NY, designs everything from sculpture to seating, mirrors and case goods, with intention and purpose. Josiah Clark gave me an enthusiastic tour of their space. Phaedo Design’s signature detail echoes through all materials in their collection, made to order. 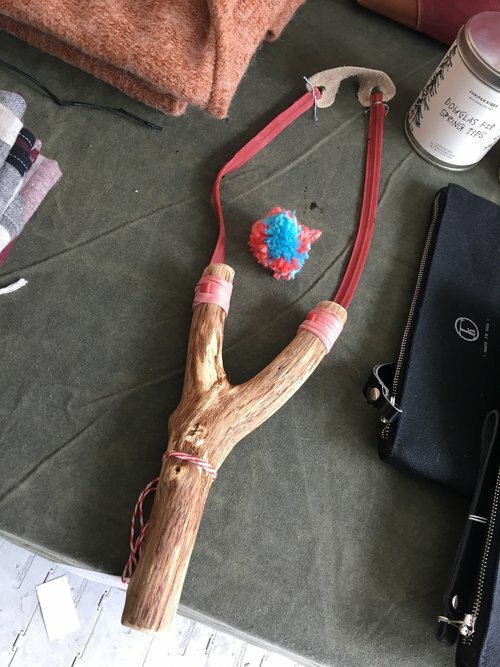 With patrons playing around with the slingshot and pompom, I couldn’t help but stop at Northern Grade. 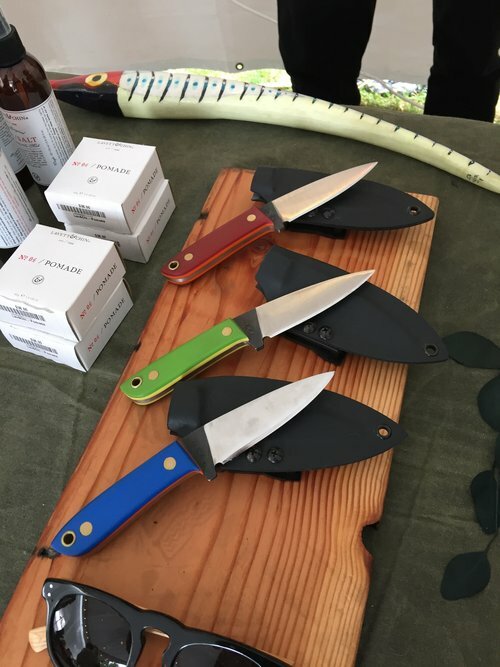 Then I noticed the beautiful knives of a local Peeskill artist Geoff Feder that has a studio near mine though we have yet to meet. What I didn’t know is that Northern Grade, a “roving market” having landed in 27 cities, now has a flagship space in the Seaport District of Manhattan. All products Made In America, I will definitely check this out next time I am downtown. 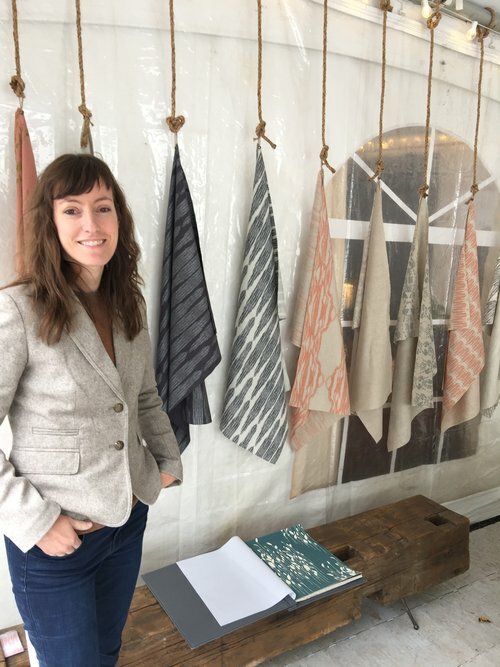 Kim Rosen, owner and designer at FAYCE TEXTILES was working as an illustrator until she turned her talent and sensibility to fabrics and wallpapers. Using printed and embroidery techniques on Belgian linen, grasscloth and paper using earth-friendly water based inks, she has earned representation in showrooms throughout the country, and in Canada and Australia too. Everything about her display evoked “made by hand” with care for the earth. These JWB Bows were so artful, I just stood in admiration of them as objet. 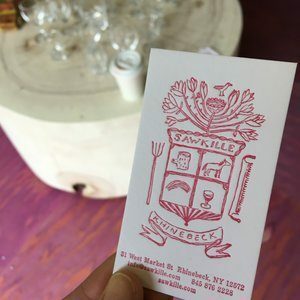 Located in the Catskills, they profess “communion with nature, admiration of world cultures, and appreciation for primitive techniques and tools”. 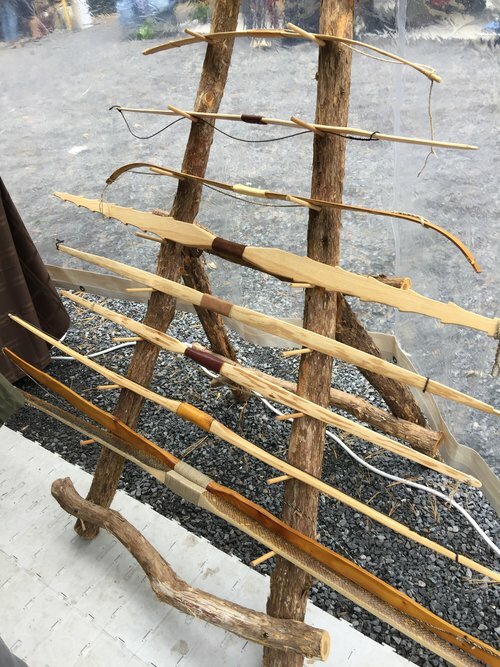 They hosted an archery course for the children which was fascinating to observe. 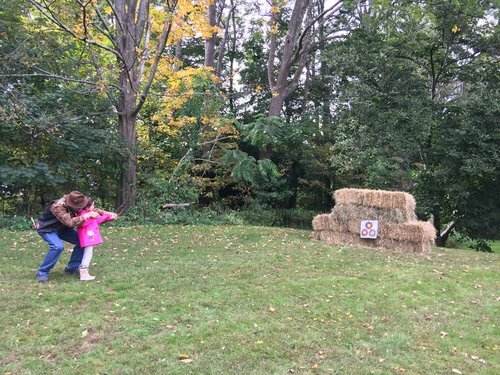 The kids felt a sense of power and accomplishment hitting the target. 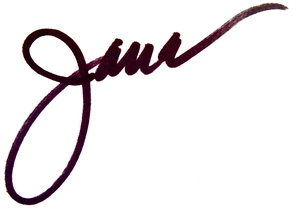 “My idea of a maker is the fulfillment of an order or commission through a craft that is considered art. Art is that divine idea that I stitch passionately in each project and reminisce with my history. 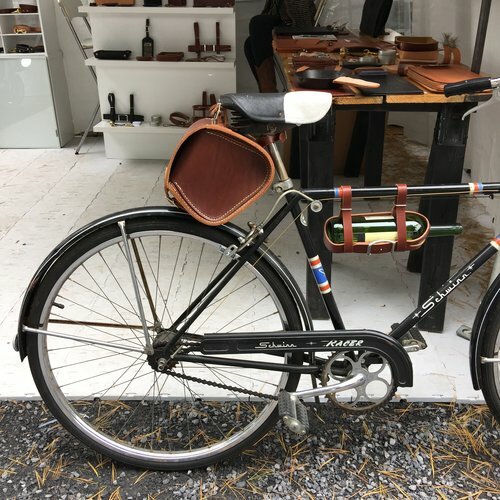 Jay Teske started working in leather, creating upholstery for motorcycles and grew his business with his wife Hadas Liebermann once they moved to Kingston, NY. 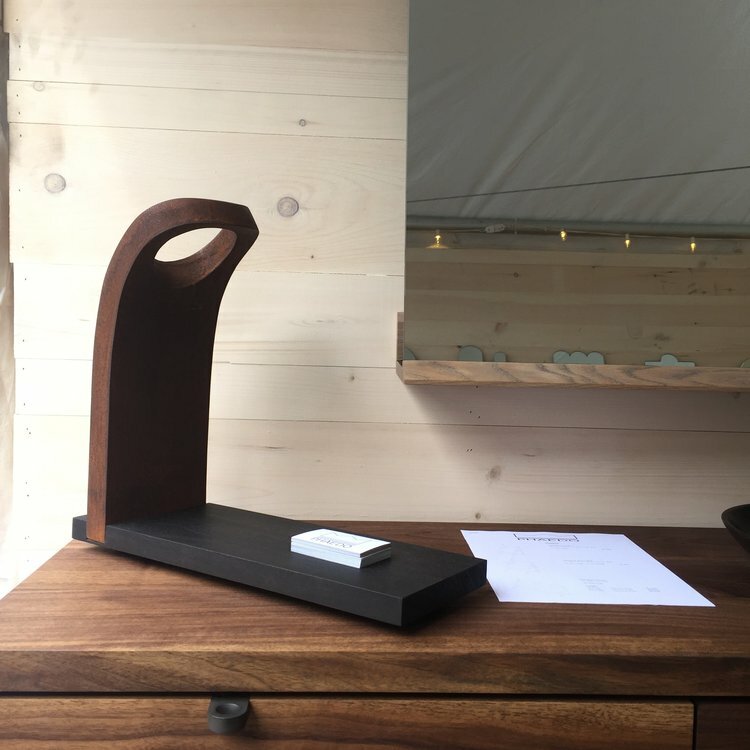 Another creative, Made in USA, maker with a great inspirational story of moving outside of NYC. Bartelby Objects grew out of designer Mary Chan’s gift making for her interior design clients. 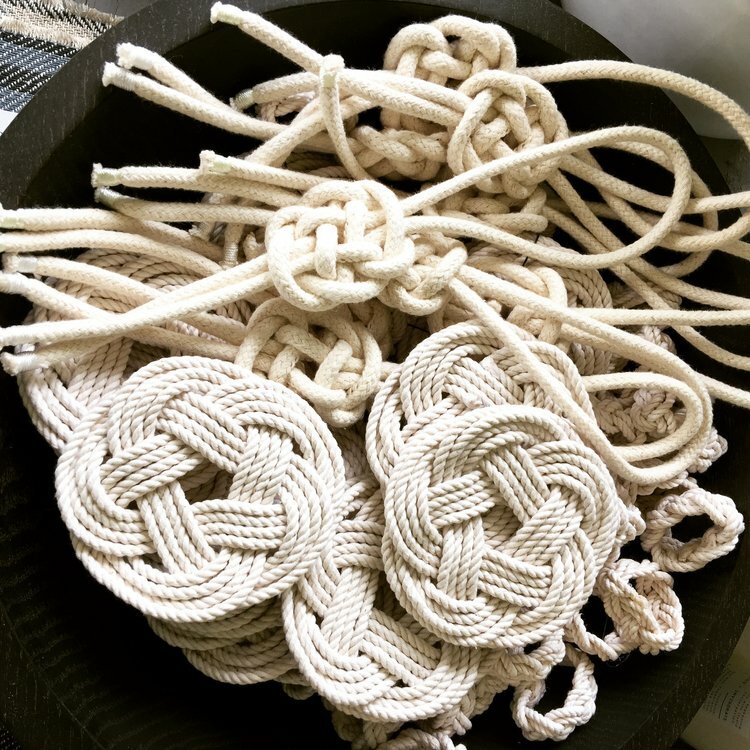 Working out of a studio in the Brooklyn Navy Yard, she uses artisan techniques and materials that promote conscious consumption. As a trimmings designer, I brake for textiles. I stopped to meet D Bryant Archie to talk shop and of course had to buy a piece. 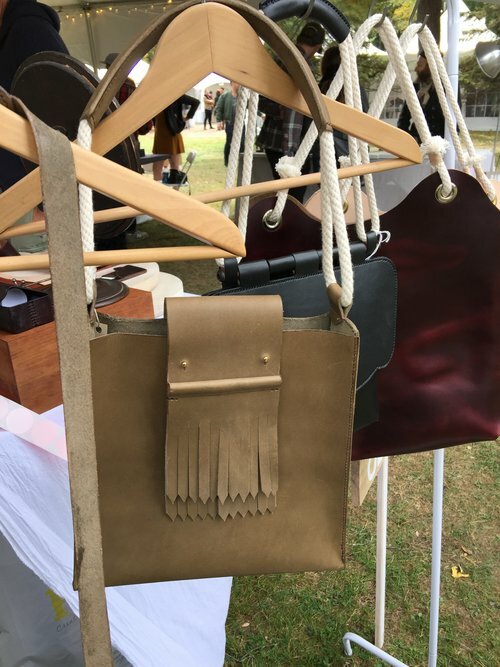 She is based in Westchester, NY working globally with artisans to preserve indigenous techniques. This year, workshops were added to the fair. 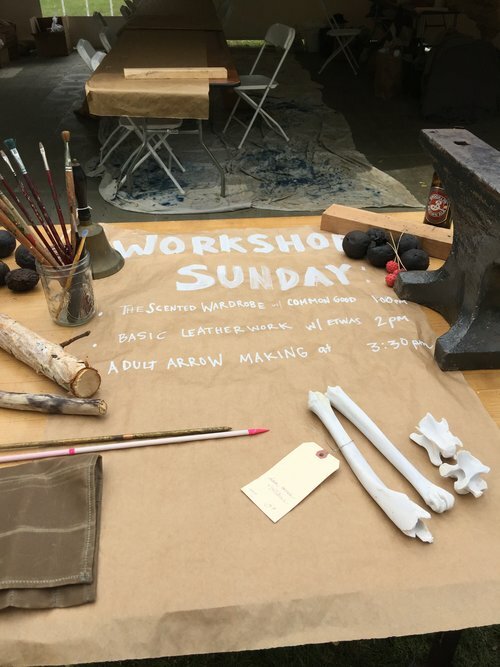 See all the offerings here>> Maker Workshops. Next year I’ll plan a family weekend bringing the kids to take advantage of the maker sessions and enjoy the fair unhurriedly. 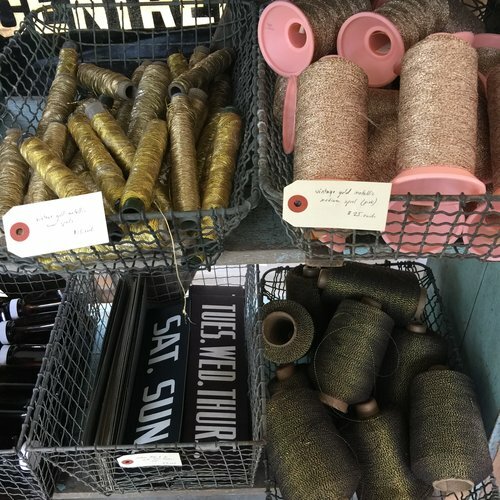 Meeting and connecting with the makers at Field + Supply is further informing my thoughts about the joys and challenges of pursuing a creative life. I am so grateful to all that shared themselves and their work and especially to Brad Ford for his vision to bring people together to celebrate the pursuit of authenticity. Thanks for joining me on this inspirational tour. WATCH my LIVE report from Field + Supply on Facebook.